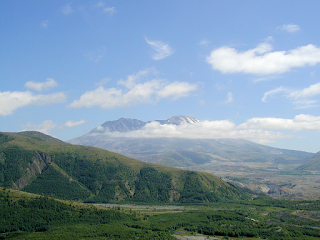 Mount Saint Helens. Mt. St. Helens photographed from the Coldwater Ridge Visitor Center. Mount Saint Helens National Volcanic Monument, Washington, USA. Photo taken about 8 miles from the mountain. Thought to be an extinct* volcano, Mount St. Helens proved herself not extinct, and began erupting in March, 1980. A large bulge developed on the north side of the mountain as internal pressure inside the mountain built up, but was not able to escape, much like a balloon inflating. On May 18, 1980, the "balloon popped" and a huge lateral (sideways) blast occurred, blowing the middle of the mountain away on the north side (the area facing you, at the center of the mountain, in the photo above). The force of the blast leveled 150,000 acres of forest (everything visible in the photo), and left a huge hole in the side of the mountain. The entire top 1300 feet of the mountain disappeared in a few minutes as it collapsed into the hole. Snow on the mountain melted from the heat, and much of the rock that had been the top of the mountain liquefied, creating a huge mud flow of rock, ash, mud and poisonous gas, which poured down the side of the mountain, then down the Toutle River Valley (which is on the right side of the photo above.) 53 people who were in the area lost their lives in the blast and mud flow. * "St. Helens, in most respects, is a typical volcano (extinct) and it affords an excellent opportunity to see and study vulcanism. ... The mountain is 10,000 feet high. It was named... for Lord St. Helens, of England." historic quote from the book "Puget Sound and Western Washington", Robert A. Reid, Publisher, Seattle, Washington, 1912.